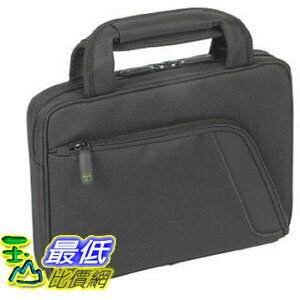 The Targus 10.2-Inch Spruce Netbook Slipcase is designed to protect up to 10.2-Inch widescreen netbooks. Constructed of recycled polyester material, the Spruce Netbook Slipcase features a large zippered accessory compartment to store a power adapter, hard drive or other accessory items. The heavily padded handles provide convenience and comfort during travel. The green lining brightens the interior making it easy to view darker accessory items inside of the bag. The Spruce Netbook case is PVC-free and nickel-free to help reduce toxins during the manufacturing process and includes recyclable plastic components. This slipcase provides a simple yet functional way to transport your netbook.